We've received a number of questions on the trajectory of US trade balance going forward. 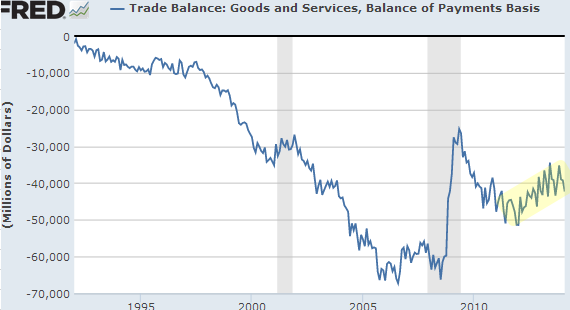 It seems that since 2011, US trade deficit has stabilized and has been gradually improving. The projections going forward however are all over the place, with some, such as the one from the OECD (see chart) predicting a deteriorating trade balance going forward. Why? The key factor in the recent improvements has been the reduction in US net energy imports - now at the lowest level in some 20 years. However, while the gap between energy production and consumption is expected to narrow some more, the US is not expected to become a net exporter of energy. If these projections from the EIA are correct, the impact of lower net energy imports on US trade deficit will diminish over the next few years (the gap between consumption and production in the chart above is expected to stabilize.) 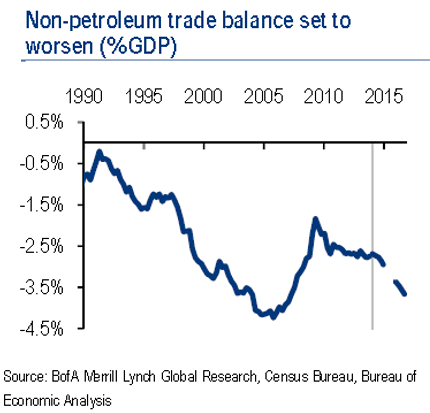 That leaves us with the non-energy component of the trade balance, where the recent trend - and more importantly the projection - is not looking great. The pace of decline [in US current account balance] largely mirrors pre-crisis trends, and is motivated by the pickup in growth that strengthens non-petroleum goods import demand. While growth in US trading partners should help to boost exports over the period, stronger domestic import growth is set to dominate. Recent improvements in the current account balance have been encouraging, but in order to be sustainable, trade in non-petroleum goods (a whopping 120% of the overall current account balance in 2013) will need to mirror trade dynamics elsewhere. Given our model results and recent weakness in the sector, we view that as a tall order. Looking further out, an aging population drawing down on pension funds and private nest eggs means further downward pressure on savings relative to consumption. That suggests the current account may struggle to hold on to any gains.